• In signing Josh Willingham to a three-year, $21 million contract in mid-December the Twins indicated that he'd be their everyday right fielder despite playing just 264 career innings there compared to 5,524 innings in left field. Getting a first-hand look at Willingham and the various other outfield options in camp apparently changed those plans, as Ron Gardenhire announced yesterday that Willingham will be the starting left fielder. Gardenhire also made official what was expected by naming Denard Span the starting center fielder, which leaves right field for ... well, everyone. Depending on how often and at which positions Justin Morneau and Joe Mauer are in the lineup right field could potentially be manned by Ben Revere, Trevor Plouffe, Chris Parmelee, or Ryan Doumit, none of whom have ever played the position on more than a semi-regular basis in the majors or minors. For years the Twins stressed how valuable Michael Cuddyer's arm was in right field, so their willingness to use Revere there when he might have the majors' worst arm and his range is of better use in the more spacious left field is surprising to say the least. If nothing else it signals that Revere is headed for a part-time role, which along with Gardenhire's stubbornness could lead to his biggest strength being diminished and his biggest weakness being magnified. If the manager were more willing to make daily shifts he could platoon Revere and Plouffe by using Revere in left field with Willingham in right field against right-handed pitching and Plouffe in right field with Willingham in left field against left-handed pitching. That's something plenty of managers do regularly, but it's something Gardenhire has always avoided with occasionally laughable results. Runners going first-to-third at will with Revere in right field would fit that bill. Whatever the case, based on Terry Ryan's offseason comments and Gardenhire's outfield announcement yesterday it seems clear that the Twins are less sold on Revere than commonly believed. They're certainly right to be skeptical, as I've been making that case since Revere was in the low minors, but the less he plays the less chance their defense has of being above average and I'm similarly skeptical about Parmelee being ready to thrive offensively. • Terry Doyle seemed like an odd choice for the Twins with the No. 2 pick in the Rule 5 draft. Despite being 26 years old he had just 15 starts above Single-A, including zero at Triple-A, and nothing about his raw stuff or track record suggested more than back-of-the-rotation starter potential. At no point has the Rule 5 draft been a sure-fire way to add useful big leaguers, but when picking so high it seemingly made sense to at least target someone with more upside. In explaining their reasoning for the pick the Twins talked about how impressed they were by Doyle's performance in the Arizona Fall League, where he posted a 1.98 ERA. However, that consisted of just eight starts and was fueled by an incredibly low batting average on balls in play that screamed fluke. My assumption was that they wouldn't have chosen Doyle if they weren't at least convinced he could stick in the majors as a mop-up man, but apparently not. Doyle coughed up 10 runs in 5.1 innings this spring and the Twins didn't even keep him around until the end of camp, sending him back to the White Sox. Ultimately it's not a huge deal, as they're out $25,000 and the opportunity to add a higher-upside arm, but it's discouraging for a supposedly scouting-heavy team to take someone atop the Rule 5 draft while citing his fluky, small sample size performance in the AFL as a big factor and then cut him five innings later. • Aaron Thompson, a 25-year-old left-hander the Twins signed to a minor-league contract in December, has been suspended 50 games after violating MLB's drug policy for a "drug of abuse." His track record in the minors is mediocre at best, but Thompson is a former first-round pick and apparently the Twins will keep him in the organization despite the suspension. Once activated he'll likely be a fifth starter or long reliever at Triple-A. • I'll have a lot more on this subject once my annual series ranking the Twins' top 40 prospects concludes later this week, but Baseball America and Baseball Prospectus recently released their annual organizational talent rankings and the Twins placed 20th and 22nd. • On a related note, Baseball America crunched the numbers to find that the Twins ranked 15th in international spending last season after ranking 12th in 2010. Miguel Sano alone got a record $3.15 million signing bonus from the Twins in 2009, but in the two years since then they've spent a total of $4.85 million internationally. • This offseason the Twins sliced $15 million from their payroll, but according to Forbes magazine in 2011 they had baseball's 13th-highest revenue at $213 million and an operating income of $16.6 million, causing the franchise's value to rise four percent to $510 million. In a game where talent can be measured by precise statistical metrics, Punto is a player whose value is harder to calculate but can’t be denied. Punto played for $750,000 last year and will make $1.5 million both this season and next season, so teams seem to be in agreement that his value is fairly limited. Then again, I've not experienced his charm in person. • Seth Stohs of Twins Daily reports that the Twins released six minor leaguers: Michael Tarsi, Dan Osterbrock, Kane Holbrooks, Blayne Weller, Matt Schuld, and Derek Christensen. Osterbrock, Tarsi, and Holbrooks each cracked my annual top-40 prospects list at one point, but none were ever considered more than marginal prospects. Christensen was a 2010 draft pick and dominated the low minors, so cutting the 22-year-old right-hander loose seems odd. • In late 2010 the Twins acquired reliever Brian Fuentes from the Angels for Loek Van Mil, a marginal pitching prospect whose claim to fame was being baseball's tallest player at 7-foot-1. He spent last year at Double-A, throwing 66 innings with a 2.04 ERA and 46-to-23 strikeout-to-walk ratio, but the righty from the Netherlands failed to make the Angels this spring and manager Mike Scioscia explained that "he's certainly searching for an out pitch" at age 27. Always nice as a writer when you find ballplayers who are avid readers on the side ... two in Cleveland's clubhouse include Lonnie Chisenhall and Kevin Slowey. • Last and least, with Opening Day right around the corner I'm restarting the AG.com "sponsor of the week" program. For details about advertising and to reserve your week, click here. • Cleveland claimed Jim Thome off revocable waivers to facilitate last week's trade, but Ken Rosenthal of FOXSports.com reports that the Indians were also the team that claimed Jason Kubel. No deal was struck and the Twins pulled Kubel back off waivers, in part because their asking price for him was much higher than for Thome and in part because the Indians ceased needing a left-handed bat after acquiring Thome. • Ron Gardenhire revealed during his weekly radio show that Thome and his agent asked the Twins to place him on waivers "to see what happened." There's speculation that Thome ideally wanted to land back in Philadelphia, where a playoff appearance is guaranteed, but he would have been merely a pinch-hitter for the Phillies. Cleveland's playoff hopes are slim, but Thome is playing every day for the Indians and homered Saturday on his 41st birthday. • Joe Nathan explained that he "would consider" waiving his no-trade clause for a Thome-like trade to a contender, but his contract complicates things. He's owed around $2 million for the rest of this season and has a $12.5 million option or $2.5 million buyout for 2012. To get even a mid-level prospect in return for Nathan the Twins would presumably have to eat nearly that entire $4.5 million and any move would have to be made by Wednesday. • Michael Cuddyer moving to first base has helped the Twins during Justin Morneau's lengthy absences, but it also appears to have hurt his free agent ranking. MLB and Elias Sports Bureau keep their official rankings secret until the offseason, but MLB Trade Rumors reverse-engineers the data and posts frequent updates. Cuddyer was projected as a Type A free agent until last week, when his listed position changed from outfield to first base and he dropped to Type B. • Based on MLB Trade Rumors' latest projection Cuddyer and Kubel are both slightly below the Type A cutoff, but a lot can still change. It's an important distinction in terms of compensation the Twins would receive if they sign elsewhere, but also in terms of how many teams figure to pursue them. Carl Pavano was an example of Type A status hurting a free agent's market, as many potentially interested teams didn't want to forfeit a first-round pick to sign him. • There are seven AL pitchers who qualify for the ERA title with an opponents' batting average above .290 and the Twins have three of them (Pavano, Brian Duensing, and Nick Blackburn). In throwing 181 innings this season Pavano has allowed the most runs (103), hits (214), and baserunners (264) among AL pitchers and also has the league's second-lowest strikeout rate at 3.98 per nine innings. He'll be 36 years old next season and is owed $8.5 million. • Scott Diamond coughed up 10 hits in Friday's spot start versus the Tigers, becoming the fifth Twins pitcher to allow double-digit hits in a game this year. Diamond, Duensing, and Francisco Liriano have done it once apiece, Pavano has done it four times, and Blackburn has done it seven times in 26 total starts. Overall a Twins pitcher has allowed double-digit hits 14 times, which leads MLB. Not coincidentally their rotation has MLB's third-lowest strikeout rate. • So far the Twins have used 16 players who weren't on the Opening Day roster and the only one of those 16 call-ups with an OPS or ERA better than league average is Anthony Swarzak. Seven are hitters and they've combined for 20 percent of the lineup's playing time while hitting .232/.281/.323 in 1,018 plate appearances. Nine are pitchers and they've logged 18 percent of the staff's batters faced while posting a 4.57 ERA in 187 innings (5.09 ERA without Swarzak). • Trevor Plouffe air-mailed a throw to first base over the weekend, but for the most part he's looked much improved at shortstop while subbing for the injured Tsuyoshi Nishioka. However, the destruction of Triple-A pitching that got him recalled to Minnesota hasn't shown up yet, as Plouffe has batted just .250/.293/.411 with an ugly 30-to-5 strikeout-to-walk ratio in 34 games since rejoining the Twins in mid-July. • Ben Revere swiped his 25th base yesterday, moving into second place on the Twins' all-time list for rookies. That sounds impressive, except the person atop the leaderboard is Luis Rivas, who stole 31 bases as a rookie in 2001. Not only did Rivas bat just .266/.319/.362 in stealing those 31 bases, he went on to steal a grand total of just 48 bases in his next 479 games. Of course, even .266/.319/.362 is quite a bit better than Revere's current .255/.301/.294 mark. • Luke Hughes went deep twice yesterday in his 73rd career game, becoming the first Twins hitter with multiple homers in one of his first 75 games since Morneau and Joe Mauer both did it in 2004. Before then the last Twins to do that were Corey Koskie in 1999 and Ron Coomer in 1996. Oh, and Bernardo Brito in 1993. Brito, who spent seven years at Triple-A for the Twins and totaled 164 homers there, managed just five homers in the majors. • Mauer came off the disabled list on June 17. Since then he's played 61 games and Cuddyer has played 55 games. Since the All-Star break Mauer leads the Twins in batting average (.320) and on-base percentage (.380) while playing more games than anyone but Revere and Danny Valencia. Not everything must fit the pre-established narrative. Speaking of which, this is one of the rare times when Patrick Reusse and I are in complete agreement. • Dr. David Altcheck, who performed Tommy John elbow surgery on Nathan in March of 2010, provided a second opinion on Kyle Gibson's partially torn elbow ligament and agreed with the Twins' recommendation that he attempt to rest and rehab the injury before going under the knife. Gibson will miss all of 2012 whether he undergoes surgery now or in two months, so the delayed decision won't necessarily impact his return timetable much. • Gardenhire finished ninth in a Sports Illustrated poll asking players which manager they'd like to play for, with Joe Maddon of the Rays holding the top spot at 14 percent. • One big Thome is back in Cleveland, but 10,000 little Thomes are still in Minnesota. • Charley Walters wrote the most St. Paul article in the history of the St. Paul Pioneer Press. • Old friend Pat Neshek learned the hard way that there's a considerable difference between "designated for assignment" and "optioned." • Delmon Young has zero walks in 58 plate appearances since being traded to the Tigers. • Since the All-Star break the Twins are hitting .247 with a .305 on-base percentage and .366 slugging percentage compared to their opponents hitting .297 with a .353 on-base percentage and .467 slugging percentage. • Overall this year the Twins have been out-scored by 144 runs for the worst run differential in the league and the second-worst mark in baseball ahead of only the Astros at -157. Last year the Twins out-scored their opponents by 110 runs. • Dating back to 2010 and including the playoffs, the Twins are 58-88 in their last 146 games. They may have to call up Mark Madsen to shoot some three-pointers in late September. Help support this site's free content and advertise your product, service, local business, or website directly to thousands of people each day by becoming an AG.com "Sponsor of the Week." 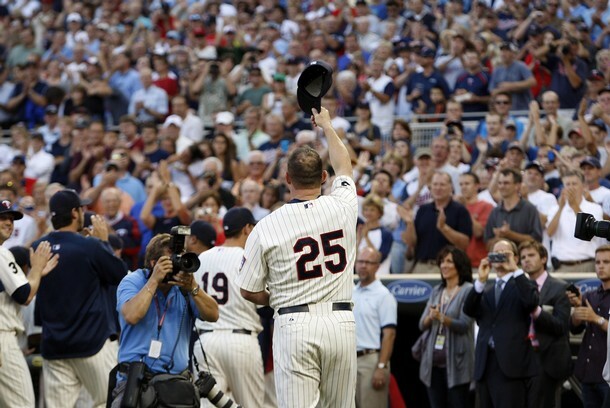 Jim Thome has been one of the few bright spots in an otherwise dismal season for the Twins, reaching 600 career homers and putting together one of the most productive seasons ever by a 40-year-old, but with the team in a depressing tailspin of 19 losses in 24 games and Thome hitting well enough to help a contender make a playoff push it made sense to trade the future Hall of Famer. There was no sense making him sit through the final six weeks of this mess. Thome was placed on waivers and claimed by the Indians, who drafted him as an 18-year-old shortstop in 1989 and watched him develop into one of the elite sluggers of all time. He spent the first decade of his brilliant career in Cleveland, winning six division titles and smacking 334 homers, and Thome waived his no-trade clause to return in the hopes of getting the Indians to the playoffs for just the second time since he signed with the Phillies as a free agent in 2003. By claiming Thome off revocable waivers the Indians became the only team eligible to trade for him, which made the Twins' options very simple: Either work out a deal with Cleveland or pull Thome back for the remainder of the year. In choosing the former they wound up with a player to be named later, but that figures to be a marginal prospect and ultimately the decision was mostly about giving Thome a chance to play in meaningful games down the stretch. Exactly how meaningful remains to be seen, as the Indians have fallen below .500 following a great start and are 6.5 games behind the Tigers with just 35 games to play. Travis Hafner is on the disabled list with a foot injury that could require season-ending surgery, so Thome will take over for him as Cleveland's starting designated hitter after batting .243/.351/.476 with 12 homers, 12 doubles, and 35 walks in 242 plate appearances for the Twins. When the Twins signed Thome to an incentive-laden one-year contract in January of 2010 they talked about adding him primarily to fill a bench role, but between his exceptional production and Justin Morneau's concussion that turned into a starting job. He hit .283/.412/.627 with 25 homers, 16 doubles, and 60 walks in 340 plate appearances, including .303/.438/.669 with 15 homers in 50 games after Morneau went down. He earned just $2 million while joining Morneau, Josh Hamilton, Miguel Cabrera, Joey Votto, and Albert Pujols as the only hitters in baseball to bat at least 300 times with an OPS above 1.000, but after flirting with other teams as a free agent Thome re-signed with the Twins for another modest one-year deal. His production dropped from amazing to merely very good, but Thome ranked second on the Twins in on-base percentage, slugging percentage, and OPS. In all the Twins paid about $5 million for 582 plate appearances of .266/.386/.562 hitting and a .948 OPS that ranks as the highest in team history among all players with at least 500 trips to the plate. Harmon Killebrew ranks second on that list at .901 and Joe Mauer is third at .874, which shows how incredible Thome was in Minnesota despite not arriving until age 39. Toss in the player to be named later and that's one hell of a return on a $5 million investment. Before he became one of the best free agent signings in Twins history Thome terrorized the Twins, batting .311/.410/.628 with 57 homers, 109 walks, and 142 RBIs in 186 games against them and turning Rick Reed into his personal batting practice pitcher. Despite destroying my favorite team Thome was always one of my favorite players and it was an honor to watch him continue to mash in a Twins uniform. My hope is that Twins fans appreciate not only how great Thome was during these past two seasons, but also how extraordinary he was before arriving in Minnesota. In addition to being just the eighth member of the 600-homer club Thome has reached 40 homers and 100 walks in more seasons than every hitter in baseball history except for Babe Ruth and Barry Bonds, who're also the only two hitters with more career homers and walks than Thome. Ruth, Bonds, Stan Musial, and Frank Thomas are the only four hitters in baseball history with more plate appearances and a higher OPS than Thome, who has a .959 mark in 10,045 trips to the plate. And his OPS for the Twins was .948, so we got to see one of the greatest offensive monsters of all time at his pitcher-clobbering best even if the fun lasted for just 179 games. 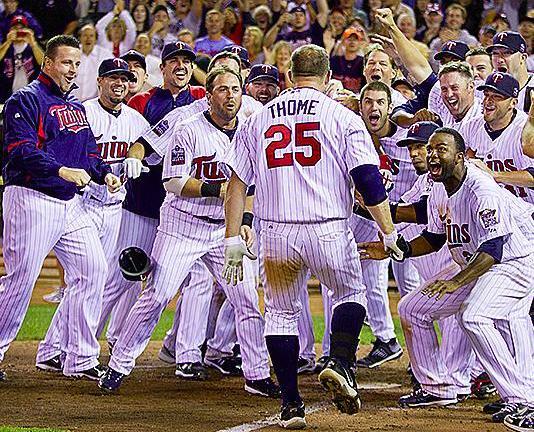 Of course, I certainly wouldn't mind Thome returning as the Twins' designated hitter in 2012. I'm still not sure what to make of the Twins, exactly. Since their MLB-worst 17-37 start they've gone 24-11, yet sit in fourth place seven games below .500, a half-dozen games behind both the Tigers and Indians, and are nowhere near full strength with Justin Morneau possibly done for the season, Jason Kubel, Denard Span, and Kevin Slowey also on the disabled list, Scott Baker dinged up, and Joe Mauer yet to look like his usual self offensively or defensively. In many divisions the Twins would be all but dead, but the Tigers, Indians, and White Sox are each flawed teams that don't look capable of winning more than 85-88 games. With even two or three of those aforementioned key players back healthy and productive it wouldn't surprise me one bit if the Twins had the AL Central's best record for the final 45 percent of the season, but is the massive hole they dug in April and May too big to climb out of in just 73 games? For the Twins to reach 85 wins they'd have to finish 44-29, which is a 98-win pace. To reach 88 wins they'd have to finish 47-26, which is a 104-win pace. While certainly within the realm of possibility for a team that has played at a 111-win pace for the past six weeks and looked like a 90-something win team coming into the season, the Twins are plenty flawed themselves and even playing 100-win ball for the final two-plus months would leave them needing some help. None of Detroit, Cleveland, or Chicago is particularly fearsome, but trailing two different teams by a half-dozen games with 73 to play is already a huge enough challenge that the Tigers or Indians getting hot, even for a couple weeks, would be extremely difficult to overcome in such a limited time frame. Not only do the Twins need to play 100-win ball, they can't afford to have the Tigers or Indians play like even a run-of-the-mill playoff team during that same time. Such is life when you're the worst team in baseball for two months and now the Twins play 19 games during the first 18 days of the second half, with a July 18 doubleheader and their next scheduled off day on August 1. And as if a roster that's been wrecked by injuries both big and small all year and simply can't afford to slump playing 19 times in 18 days isn't drama enough, the trade deadline looming on the final day of that brutal stretch adds another wrinkle. I'm still not sure what to make of the Twins right now, but by July 31 everyone should have a far clearer picture of where they stand one way or another. And that's a good thing. Clawing further into contention by then would leave the Twins with an opportunity to add a key piece or two for the stretch run, but failing to make up any ground during those 18 crucial days could convince them to cash in some impending free agents for help in 2012 and beyond. 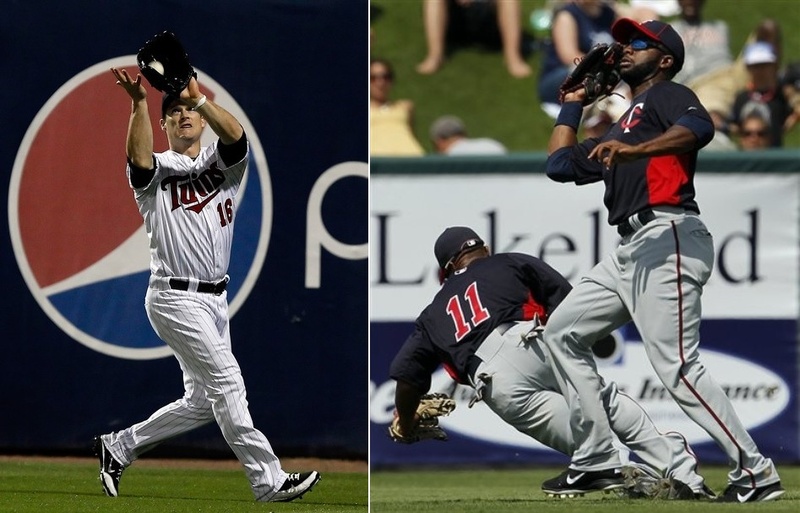 Eighteen days to make or break a season and help shape the Twins' future. They need to play consistently well and avoid slip-ups in series against the Royals, Indians, Tigers, Rangers, and A's, all without rest for the weary, and the front office also needs to realistically and smartly evaluate where they stand leading right up to the July 31 deadline. Normally the line between buyer and seller isn't so thin, but then again nothing about this season has been normal. This week's content is sponsored by the St. Paul band Shoveldance, so please help support AG.com by checking out their new album.